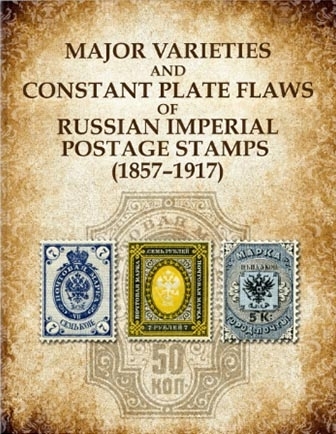 Until now, detailed information about the stamps of Imperial Russia could only be found by consulting multiple sources that are often obsolete, difficult to find, lacking in detail, inconsistent in their listings, and overwhelmingly published in Russian. This makes it hard for collectors--especially those not fluent in Russian--to identify and value varieties of these stamps. 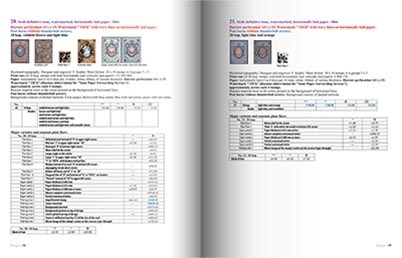 This is the first comprehensive, illustrated, and English language summary of available information about all stamps issued in the Russian Empire from 1857 to 1917, their varieties, color shades, perforations, watermarks, and constant plate flaws. Approximate retail values given in U.S. dollars or as multipliers of the catalog value of the basic stamp. 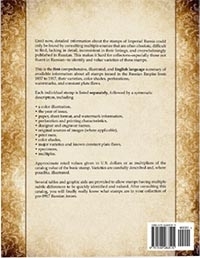 Varieties are carefully described and, where possible, illustrated. 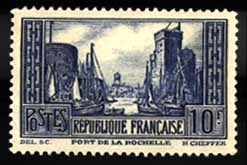 Several tables and graphic aids are provided to allow stamps having multiple subtle differences to be quickly identified and valued. After consulting this catalog, you will finally really know what stamps are in your collection of pre-1917 Russian issues.